Last night was the opening of an exciting young Scottish artist, Charlie Anderson, at the "Art of Money" gallery. The work is vibrant and colourful. First glimpse it appears to be a collage of posters and billboards or newspaper cuttings, however it has all been created by paint. Street art in the gallery. Charlie is winner of several awards including being winner of the British Airways Degree Show. prize in 2009. This is an artist to watch. His style is somewhat reminiscent of Warhol. «Louis» would like to see more of his work. Great shot, and thanks for the heads up about the artist. Very interesting work. It makes me think of comic book covers. 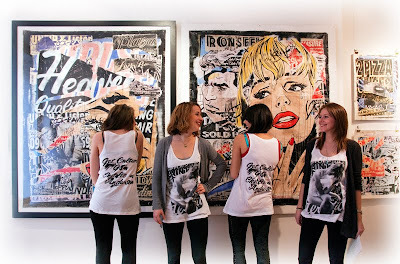 I love those girls in the matching t-shirts in front of the paintings. They make your photo even more interesting. That building on my site today is just an office building and frankly it looks a little out of place on the corner where it sits. The office complex I work in is only two stories and tends to blend in well with the residential area surrounding it. It kind of makes me think of Andy Warhol! Love the girls in their tank tops! Very interesting - the sort of work that can be gazed at for hours and still surprise with details unseen before. I like his style. Who are the babes? Three cheers for Mo! Your photo today has loads of energy, color and fun. (Plus pretty girls.) As you said, it is "vibrant and colourful." My kind of art - great stuff!! And what a fantastic idea to use live models as advertising!!! A drunken west coast Scot obviously. Still, the girls look good at least!